In September, I wrote two posts about a company and website called Shapeways. If you're so inclined, you can re-read them here and here. 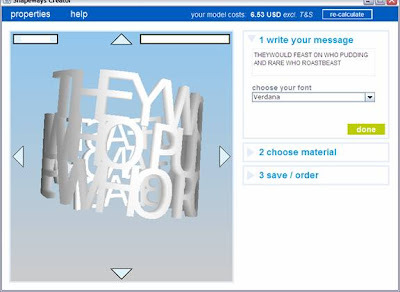 Shapeways is a three-dimensional printer that allows anybody with access to a 3-D renderer to upload a model and they will print it out and ship it back. Three-dimensional model printers have been around for a while, a little while at any rate. Where Shapeways takes it a step beyond is that they have an online rendering program and anybody with a computer can make his or her own fully customized and one-of-a-kind thing. This kind of technology integration curls my toes. I mean, ten years ago nobody'd ever heard of Google, or a blog, or a 3-D model printer for that matter. Amazing! Well, just in time for Christmas, Shapeways has come up with a couple of seasonal offerings and the one that I think is just plain cool is a napkin ring that sells for between $5 and $7. 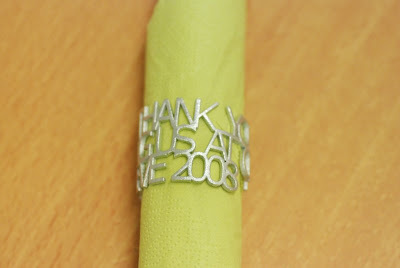 This napkin ring is silver and it can be composed of any copy you'd like it to be. They would feast on Who-pudding, and rare Who-roast beast. Which was something the Grinch couldn't stand in the least!